News TV Channel / KTVK, virtual channel 3 (UHF digital channel 24), is an independent television station located in Phoenix, Arizona, United States. 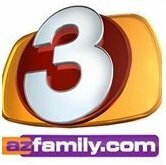 The station is owned by Meredith Corporation, as part of a duopoly with CBS affiliate KPHO-TV (channel 5). It's studio facilities is located on the northwest end of the Central Avenue Corridor in Phoenix; KTVK's transmitter is located on South Mountain. Its signal is relayed across northern Arizona on a network of translator stations.